Funding Partners: Seven Hills Global Outreach, The Rotary Club of Putnam, CT, and many individual donors. In Haiti, there is an average of 12 motor vehicles per 1000 people…and significantly less on La Gonave. For several years now, Roots of Development has been helping APDAG, its local partner on La Gonave, identify potential sources of revenue and turn them into sustainable income-generating business initiatives. In that context, in 2014, APDAG developed a business plan that focused on addressing the lack of reliable transportation options for island merchants. 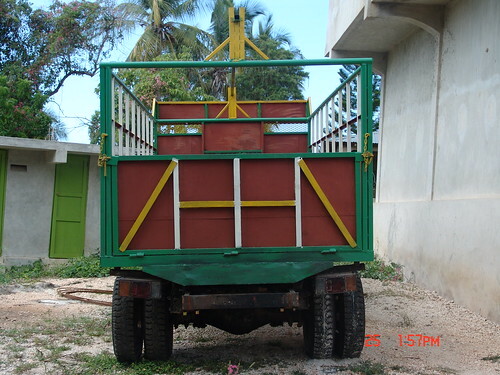 With Roots of Development’s support, APDAG purchased a truck, hired two employees, and began transporting merchandise around the island. For the past twelve months, APDAG has successfully been managing the business, bringing in about $700 of monthly income, and paying back the loan Roots of Development provided to finance the initiative.